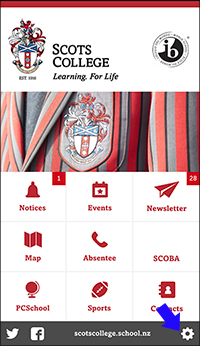 The Scots App is compatible with iPhones and Android devices. It is designed to make College day-to-day information and updates more accessible, and has been developed over the past year with recommendations and requests from a panel of senior students and feedback from our parent community. It enables users to access up-to-the-minute school notices and announcements, event and exam calendars, sports draws, reminders, direct dial the absentee line and contains key contact information. Like all digital tools this app will continue to grow and evolve with use. Much of its future functionality will be developed as a result of further student-led ideas and parent requests. It can be downloaded for free from both the Apple iTunes App Store and Google Play by searching ‘Scots College App’. Or click on one of the links below. By default, the Scots College App will send you all messages and alerts. But you may be interested only in notices for a particular school ie you have a Year 9 son so you would like to receive Middle School messages only. Or that you bring your son to school and pick him up everyday so transport-related alerts are of no interest to you. 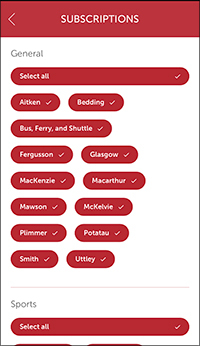 Here are the instructions on how to customise your Scots App. Tap on the cog at the bottom right of the screen. The Subscriptions screen lists down your choices for filtering notices. 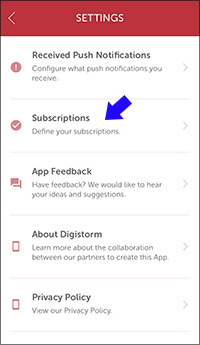 To subscribe to a category, simply tap on the label. A tick will appear at the right hand side of your choice/s. Once you have done this, the app will display notices and events for your particular choices only. Tap on the < icon at the top left to return to the home screen.